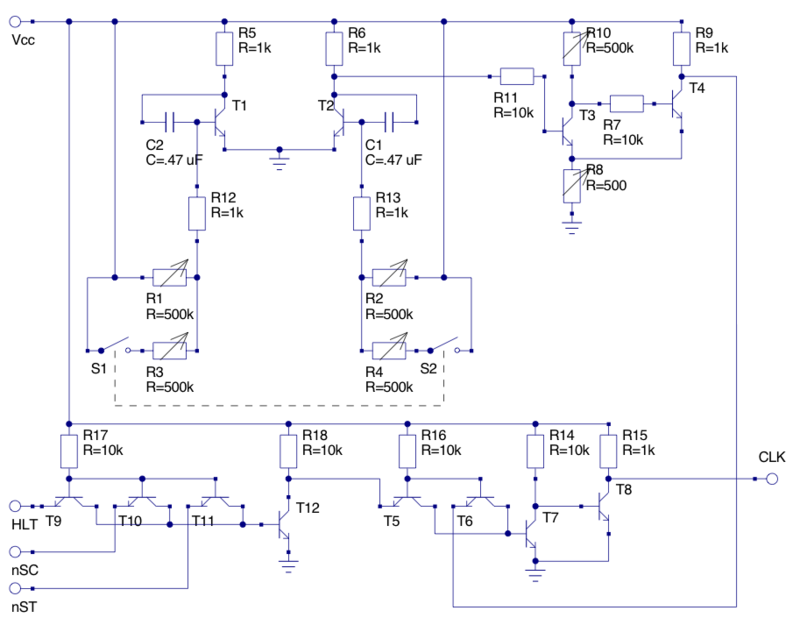 The clock is generated by a 2-transistor astable multivibrator tied to a Schmitt trigger. Here's the schematic. The output frequency is stable from about 30 Hz to 300 Hz, which could easily be increased by using smaller capacitors. Each clock from the clock generator switches the clock phase on the positive edge. Clock phases are used so that transparent latches can be used for registers to reduce transistor count at the price of speed. The state clock (SC) and write clock (WC) are generated from two positive edge-triggered flip-flops with input from combinatorial logic. The initial state is 00. Each flip-flop requires 19 transistors (5 NAND2 gates and 1 NAND3 gate), thus 38 transistors are required to keep phase state. Asynchronous reset is accomplished by pulling the inverting output to ground via an open-collector NOT gate for each flip-flop. Therefore, the total transistor count is 42. This is the logic used to compute the next clock phase. Note that both inverted and non-inverted outputs are available as outputs, but the input must be non-inverted. 7 transistors are needed for this logic. Eight positive edge-triggered flip-flops clocked from the state clock are used to keep the state. The next state is computed from combinatorial logic. The initial state is 1000 0000. Each flip-flop requires 19 transistors plus 2 for reset. Thus 168 transistors are needed here. Both inverting and non-inverting outputs are available, but the input must be non-inverting. 31 transistors are needed here. The class decoder determines the type of instruction stored in the I (instruction) register. The I register provides constant inverted and non-inverted outputs to make decoding easier. 24 transistors are needed here. The function decoder determines the ALU operation to perform for C2 instructions and the control lines to drive for C1 and C3 instructions. Note that the logic for branching is handled separately for C0 instructions. Both inverting and non-inverting outputs are provided to make the control line decoder simpler. This drives the 22 control lines for the computer. Due to the number of transistors needed, it is split across two modules. The first module controls lines 0 through 12 inclusive. The second module drives lines 13 through 21 inclusive (including the TB line). 119 transistors needed for the first module. 116 transistors needed for the second module.